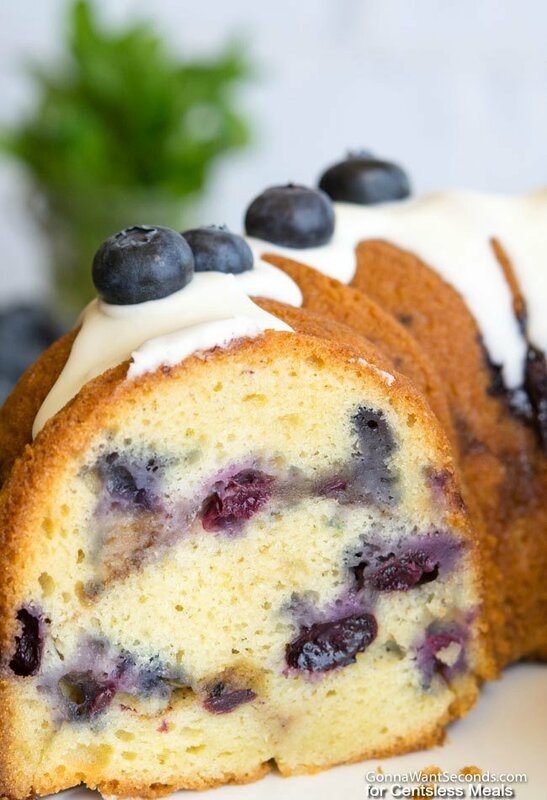 Blueberry Coffee Cake is the perfect tender cake loaded with fresh blueberries. Who doesn’t love a good coffee cake? I do, and this recipe for Blueberry Coffee Cake is one of my all-time favorites. The ingredients are simple and quick to put together, and the result is a moist cake that you can serve at pretty much any time of the day. Pin it to your CAKES BOARD to save it for later! 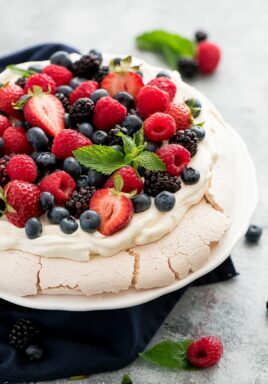 Blueberries are a seasonal berry, so I make this recipe most often in the summer. But it’s gone over really well year-round – I’ve even served it up with cider over the holidays! This recipe for Blueberry Coffee Cake doesn’t have the classic “crumble” topping you might be used to in a coffee cake. 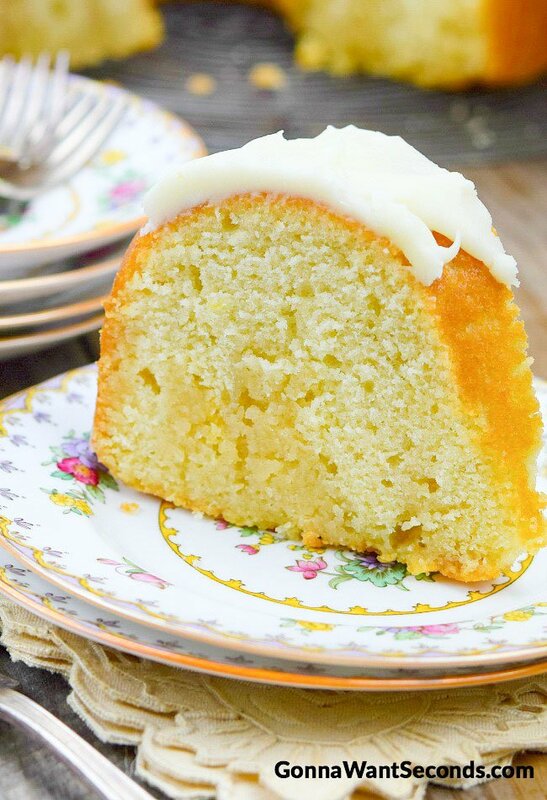 But I promise – you’ll love the glaze on this cake even better! Why Do They Call It a Coffee Cake? Coffee cakes could be called a social dessert. And they have a very social history. The first coffee cakes were brought over to North America from Europe, but they were more like sweetened breads than actual cakes. The first cakes that were considered “coffee cakes” were breads that were shared with friends over – you guessed it – coffee. They were enjoyed the same way in Europe and in North America, but it was North Americans that began to play with the recipe. Over time, the sweet breads evolved into cakes. And because they were usually served with coffee, they began to be called coffee cakes! Do Coffee Cakes Have Coffee in Them? Even though this is a recipe for a Blueberry Coffee Cake, you won’t find any coffee in the ingredients. In fact, there aren’t too many recipes for coffee cake that do contain the drink. We call them coffee cakes because they’re a great informal dessert, perfect for sharing with friends over a cup of coffee. Butter is Better: Use real butter, many margarine products have a lot of water in them which affects the texture of the cake. 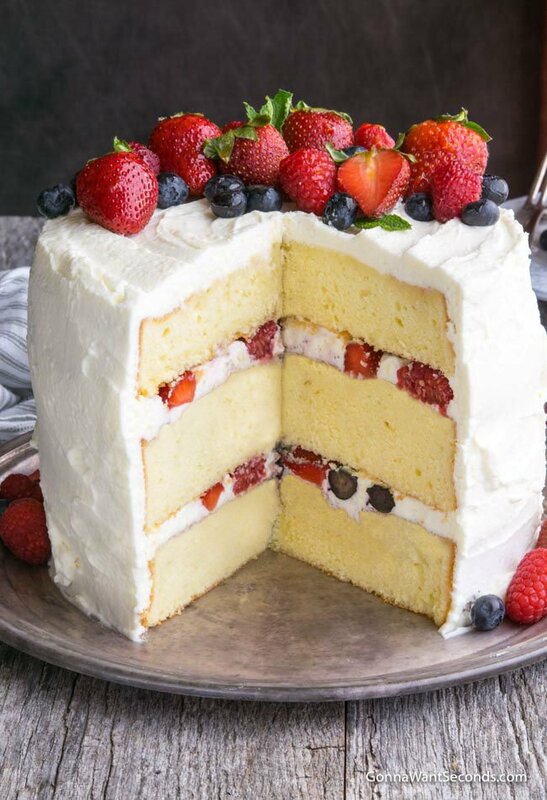 Berries Throughout: Layer the berries with the cake to distribute them throughout. 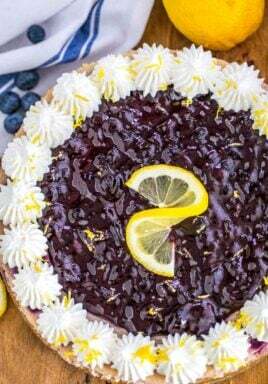 Use Fresh if Possible: Frozen Blueberries Can sometimes bleed causing the color of the batter/cake to be less than desirable. 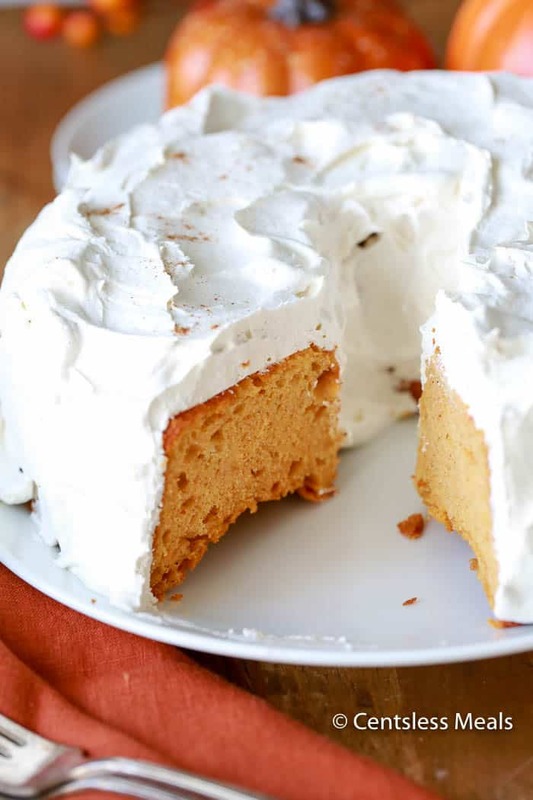 Cutting: Use a serrated knife to easily cut through this beautiful cake without pulling the crumbs apart. This recipe for Blueberry Coffee Cake is going to be your favorite. 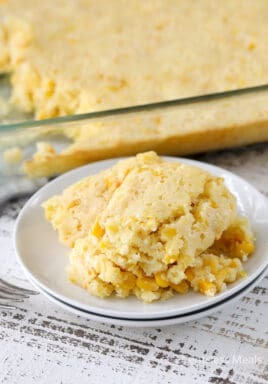 You can serve it when it’s still warm from the oven or you can let it rest at room temperature. 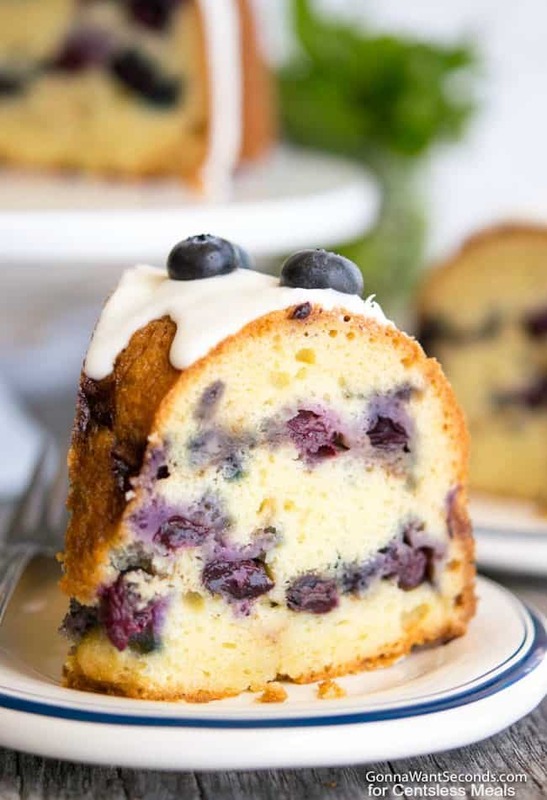 My family loves the cake on summer days with a scoop of vanilla ice cream, of you could garnish your Blueberry Coffee Cake with a handful of fresh blueberries! 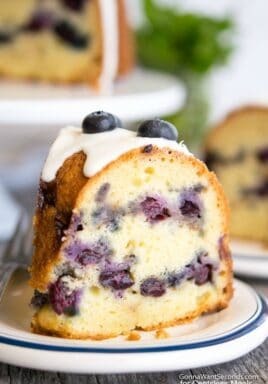 Any way you choose to serve it, I know you’ll love this recipe for Blueberry Coffee Cake just as much as I do! 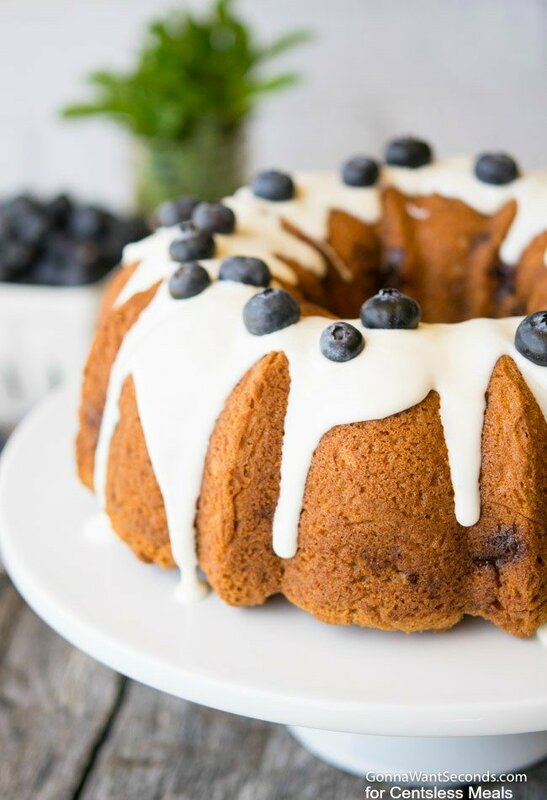 Blueberry Coffee Cake is a super simple and quick recipe that results in a moist and delicious cake that you can serve any time of the day. Grease and flour a bundt or tube pan; Set aside. Preheat the oven to 350 degrees F.
Cream butter and sugar together in a large bowl until light and fluffy. Add in the eggs one at a time, mixing until yolk disappears, then the vanilla. In a separate bowl, whisk together flour, powder, baking soda, and salt. Add to cream mixture alternating with the sour cream until well combined. In a small bowl combine brown sugar, flour, and cinnamon; Set aside. Pour a third of the batter into prepared baking pan, spreading evenly. Sprinkle half of the brown sugar mixture over the batter in in the pan. Place half of the blueberries on top. Repeat layers then top with the remaining batter. Bake until cake tester inserted in the center comes out clean, about 55-65 minutes or until. Allow cake to cool in the pan, set on a wire baking rack for 10 minutes. Remove from pan and let cool completely on wire baking rack. In a medium mixing bowl, whisk the powdered sugar and 2 tablespoons of milk together until smooth. Add more milk as necessary to obtain a pouring consistency. Drizzle glaze over cooled coffee cake. Garnish with fresh blueberries. Kathleen is a recipe developer, passionate home cook and the author of the blog Gonna Want Seconds. She has been married to her best friend for 32 years and has two great kids, two Bernese Mountain Dogs, a Quarter Horse and a little green parrot. She is obsessed with cookbooks, cowboy boots, red wine and vintage costume jewelry. Kathleen’s recipes are all tried and true, tested and tweaked and, most importantly, family and friend approved! So sweet! Your sis will be so lucky Colleen!